Ashley: Now that we’ve established Frasier and Martin are going to stick it out, “Dinner at Eight” further expands on the differences between the two brothers and their father. One of the best things about this show is the emphasis on food, especially fine dining. Niles and Frasier love to eat out at the best restaurants in Seattle, nearly everything is French. They want to get to know their father better, everyone likes to eat, so hey, let’s take dad to dinner. This is also the episode where Niles meets Daphne. His infatuation is introduced here as Niles coyly tries to invite Daphne to dinner with the family when Maris bows out, using one of many bizarre excuses that adds to the eccentric portrait of Maris Crane. Niles’ unrequited love for Daphne is one of the best comedic storylines in this series. It starts in this episode like a little flicker, very sweet with a gift of Devonshire cream “for dad” and as the seasons go on it gets better and better. Andrew: Niles’ infatuation with Daphne can, to me, get a bit uncomfortable. What you refer to as a sweet gift can viewed as a pathetic pretense to admire someone from afar. Fortunately, in both of these episodes, Frasier calls out Niles for his strange behavior. I think it’s important for the other characters to remind Niles that he’s married and that his efforts are not very subtle. Daphne, however, doesn’t seem to pick up on the weirdness of his behavior. Ashley: I think Niles’ admiration for Daphne starts out a little detached (and still, how Daphne never noticed his behavior is completely beyond me) but it becomes a “thing” in the show i.e. “what is Niles going to go in this episode to prove his unrequited affection for Daphne and how will she strangely not notice it?”. I think this comical approach initially is what I loved about the Niles/Daphne dynamic. I never found Niles’ behavior to be creepy because I just enjoyed the comedy within it. This is a very funny episode, but it has taken on a new significance for me because I recently an experience similar to the dinner scene from which the episode gets its title. My dad, brother, and I went to a greasy spoon pizza place that I was none too pleased with. After expressing my disdain for the menu and quality of food, my dad told me to stop acting like Frasier Crane. So I have a little built-in empathy for Frasier and Niles’ attitude toward The Timber Mill. And while the episode’s point of view is summed up in Martin’s speech about the difference between being refined and being a snob, there are enough points in Frasier and Niles’ favor to remind us that Frasier isn’t about laughing at refined sensibilities. It’s about watching people with such different attitudes trying to adjust to each other. For example, cutting off people’s ties is rather antagonistic. Martin might see it as a bit of fun, but one person’s fun in another’s destruction of property. 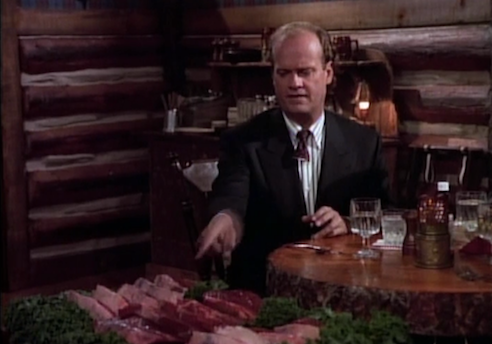 Frasier later expresses a desire to have a steak that had been properly refrigerated rather than selecting one from the Beef Trolley, and I was on his side there too. It’s only when Frasier and Niles became rude to the waitstaff that my sympathies for them evaporated. Frasier and Niles think that they are paragons of class, but there is nothing more classless than demeaning a person because of the job they hold. Ashley: The opening scene of “I Hate Frasier Crane” demonstrate that the Family Crane and Daphne are all still trying to find a rhythm as a newly-formed family. Daphne, technically a servant in Frasier’s home, makes dinner and then leaves for the kitchen to eat. Martin, on the other hand, tells her to sit with them like a family. The brothers start eating and Martin interrupts asking them if they say a prayer before they eat. And they keep trying to eat when they think the prayer is over (also, I think this is the only scene consisting of any religious affiliation outside of Christmas until season six). I like this episode because this is Frasier’s first real interaction with the population of Seattle. Now that he’s a public figure, he’s going to be getting some criticism which he doesn’t take well. At all. Here he gets in a tiff with a columnist from the paper, later escalating into a public duel. From what we’ve gathered about Frasier thus far, agreeing to such a thing is out of character. When he talks to Martin about it, they two get into a disagreement about what is essentially their own personal definitions of manhood. For Frasier, it’s using words (like he does on radio show to defend himself) and his position in the city. For Martin, it’s sticking to your word and standing your ground, getting into a fight if you have to defend your name. Andrew: The point of view of “I Hate Frasier Crane” is a bit more muddled, in my opinion. It certainly sets up that Frasier has trouble taking criticism and that Niles is always going to be there to gleefully ensure Frasier knows that people don’t like his radio show. But when Frasier agrees to the fistfight, I wasn’t quite sure what the episode was trying to say. The episode explores what it means to “be a man,” with Frasier arguing that men are civilized and should solve disputes intellectually, while Derick Mann believes men are supposed to back up their opinions with physical strength when challenged. This would be all well and good, but after Frasier, in a fit of passion, succumbs to weakness and agrees to the fight, he believes all he had to do to prove himself a man was to agree to the fight. He claims that his reputation would be ruined if he goes through with the fight, but doesn’t realize that his reputation was ruined the minute he agreed to it (he went against his own beliefs) and would be further damaged by not showing up (he doesn’t honor his word and really is the “chicken” Mann accused him of being). On the other hand, Martin is right when he tells Frasier that he can’t back out of the fight. But Martin also was proud of Frasier for agreeing to the fight, underscoring that Martin subscribes to the Mannian school of manliness, rather than Frasier’s intellectual approach. Ashley, what are your thoughts on the point of view of “I Hate Frasier Crane”? Ashley: You make some great points about Frasier’s agreeing to the fight. Frasier is so put together all the time that when he does have these “fits of passion” (much later, in season 5 for instance, in Frasier Gotta Have It) they’re especially out of character and comical. It’s nice to see a character so buttoned up and then in these very human moments all that refinement can go out the window completely. I could even go so far to say that Martin’s initial reaction to Frasier saying he wasn’t going through with it was a Martinesque “fit of passion”. In the end, though, he always supports his son. This was a great way to show fatherly love for his son and it’s the first time we really see it. Andrew: I’m not so sure Frasier’s fits of passion are out of character. Despite his refined taste and high class affect, he is extremely passionate. I also have a theory, which will be fun to test as I write these reviews, that Frasier and Niles are only playing at class. They do what they think they need to do, act the way they think they need to act, to be accepted by “the right people.” I think that they truly enjoy opera and wine and fine French cuisine, but they play at being what they think people who like those things should be. In “Dinner At Eight,” Martin calls the two of them out for being classless in their efforts to be high class, and reminds them that although their mother had refined taste, she never acted the way they were. Then in “I Hate Frasier Crane,” after succumbing to his baser instincts, Frasier says he he won’t go through with the fight because he is concerned about his image. 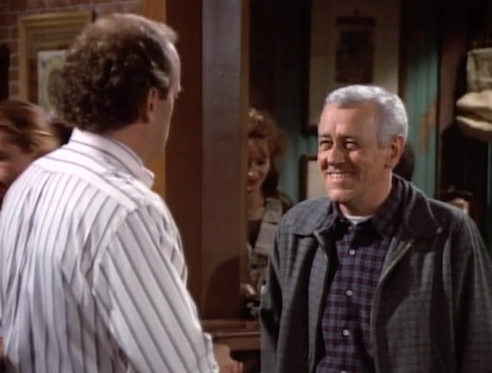 And after the fight nearly happens, Frasier indicates that the experience was enjoyable, further showing that base pleasures excite Frasier just as much as the next man. Niles is no better. 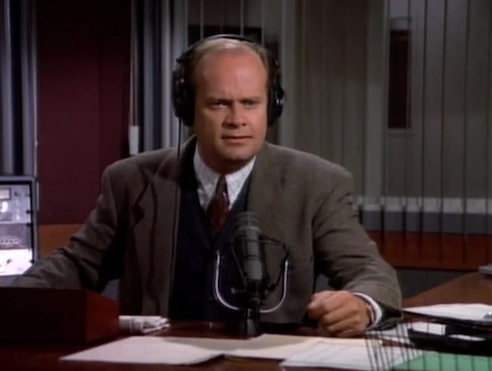 He puts Frasier down to make himself feel better; every time Niles mentions Frasier’s radio show, it’s accompanied by a snide remark or a diminutive adjective (such as “little radio program”). Or look at Niles’ interactions with Roz, whom he meets for the first time in these episodes. Throughout the early seasons of the show, their relationship will be based solely on sniping at each other. Eventually, their barbs become good-natured, before they settle into become friends, but for now, Niles sees Roz as a working-class woman of loose morals, and he never lets her forget it. That Roz can respond with witty retorts is a reminder of the “no dumb characters, no dumb jokes” rule; Roz does not have Niles’ education or refined tastes, but that does not make her unintelligent. The irony is that Frasier and Niles use their wit to do to people what Billy Kreasle used his physical strength to do to the Crane boys. Frasier and Niles remain insecure about themselves, and appear to use their ideas about what people who like what they like should act, instead of forging their own identities. Dad! The mud pie’s coming!